The transportation idea that has been making the internet rounds this past weeks is the “straddling bus“. The idea is to combine the best (worst?) of buses and trains to simultaneously preserve auto traffic. The bus would run on tracks or guided lanes above moving cars on a typical road and connect to above ground stops to let passengers on and off. Consider me unimpressed. I admit that it is thinking outside the box. However, if we’re going to go through the cost of building tracks, why not just build a train? It has to be cheaper to build and operate than this behemoth. Again, if we’re going to build dedicated stops, why not just run bus rapid transit or a train? Isn’t that easier? What I hate about this idea is that it prioritizes the movement of cars. Haven’t we already learned that it is a mistake to build cities that depend on cars first and foremost? Let’s build transit systems that encourage citizens to utilize public transportation first, rather than as an alternative. The last part I do not trust about this concept, is the skill of the drivers passing through and around this giant machine. I work for the Chicago Transit Authority’s law department currently and I can tell you that the CTA’s buses and trains get into an awful lot of collisions with bad drivers, or just because there is a lot of traffic. I would not trust drivers to successfully navigate around and through this hulk. It is sure to be dinged, bumped, or straight-up collided with on a frequent basis, drawing all positive attributes to a screaming halt. I appreciate transportation ingenuity, I welcome it. I just hope no city dedicates its resources to these unwieldy wheels of innovation. Scientific American features stories from past issues 50, 100, and 150 years ago in each publication. 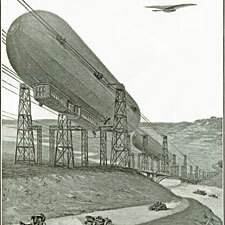 In this month’s issue the 100-year story was a snippet from a feature regarding a proposed zeppelin-railway system. In 1909 the New Jersey Zeppelin disaster was still 28 years away, so I do not blame this transit dreamer for scheming. However, given that railway electrification was emerging at the end of the nineteenth century and railroads could not yet achieve 125 miles per hour, nor could cars and the Wright brothers had made their first successful flight just 6 years prior, this idea does not seem as stupid as it appears to the 21st century eye. I hope that we live in an age where people continue to dream boldly and ambitiously such that future generations can selectively pick out ideas to poke fun at. Right now Americans struggle with the idea of high speed rail let alone anything more innovative or revolutionary in the transportation sphere. May America once again invest and dream grandly regarding its transportation future. I wish I could claim credit for this idea, but I cannot. Today in a class of mine the idea of car vehicle or vehicle mile traveled cap and trade was briefly bandied about. Cap and trade is the basic idea of setting some sort of limit on the use of a commodity and then giving permission for those who use the commodity to trade their allotted value of that commodity such that those who see the allotment as a surplus can trade to those who are in greater need of that commodity. The idea is to spur innovation in use of environmentally hurtful products such as oil and coal, generally. Such a “cap and trade” (CAT) system would establish a mileage threshold and allow vehicle owners who drive fewer miles to use them later or sell them to vehicle owners whose mileage surpasses the allowable threshold. Credit and debit amounts would reflect relative fuel-efficiency based on EPA gas mileage ratings or similar manufacturer data. Administered most effectively at the state level, such a program would generate massive government revenue to research alternative energy sources. Reducing fossil-fuel consumption comes down not only to increasing miles per gallon (MPG) but to reducing miles driven per vehicle (MPV). Reducing MPV saves oil more directly than either the technological improvements that impact CAFÉ standards or increased gas taxes. However, such a cap and trade program is effective and efficient only if it is coupled with a variety of other transit investments including new public transportation resources. In addition, such a cap and trade system would be effective for encouraging re-engineering of zoning plans that facilitate sprawl and low urban density. Without giving people better options of where to live and how to get around such a cap and trade program is simply a tax for those who live further away from their place of employment. However, encouraging people to move closer to the central and regional cores of metropolitan areas is a relevant goal in itself. Such a system, by making driving less desirable, also drives down our reliance on oil, always a good thing for political, social, economic and environmental reasons. Of course, my notion right now is exceedingly vague and specifics would have to be developed on just what the cap on vehicle miles traveled would be, whether to create such a system at the federal or state level, how commercial vehicles would be allotted credits and by what means the vehicle miles traveled credits could be traded. I personally would suggest establishing higher credits for commercial vehicles like delivery trucks and tractor trailers. We cannot get rid of vehicles like FedEx trucks or bakery delivery vehicles. However, you will find little love lost from me regarding 18-wheelers. The sooner we can get a percentage of that freight off the roads onto the rails the better, if you ask me. America needs to shed its auto infatuation. That automobile is a tool and a useful one, but it should not be the source of daily existence for hours a day. Getting people to live more densely, to utilize alternative transportation options and to be less dependent on oil all could be accomplished by a VMT cap and trade system. My friend David Gasser sent me the following video of traffic engineering, or lack thereof, in a Dutch community, featured on CBS (I am sorry, I could not figure out how to embed a CBS video on WordPress). The footage (beyond the fact that it is still jarring to see people steer cars on the right side) is rather fascinating. The segment also reminded me of a post by the Infrastructurist on the same issue (based off a great explanatory post on the Project for Public Spaces). The Infrastructurist posited on whether or not such systems could work in America and I have been wondering the same thing. Eric Dunbaugh of the Texas Transportation Institute has looked at the fatality rates on “livable streets”–broadly speaking, those that aren’t mini freeways–in the US and found that they are considerably lower (pdf). Apparently, using street design to wean drivers from highway-style driving habits really does save lives. We Americans do love our speed. Saying, “We’re going to take this wide smooth inky-black four-lane street with bright painted lines you’re used to–where you’re functionally encouraged to go 15 mph over the speed limit and all you have to worry about is staying in your wide well-marked lane and do what the traffic lights tell you–and replace it with a ‘naked’ street, where you’ll be jumbling around with everybody and just have to be a grownup and go slower and be considerate and observant,” will not necessarily be the beginning of an easy conversation. But it’s certainly an important one. I am attracted to these ideas on traffic for the simple reason that they have been proved to save lives. Transportation deaths are tragic and we should do all that we can to decrease them. However, I am skeptical of this idea ever taking hold in America. Traffic signs, wide lanes and stop lights are not just part of our culture we seem to be frequently defined by them and consider them birthrights. After all, consider all the people who you have heard state that they are from a town with two stoplights or that they are near exit Z off the highway. Moreover, Americans are a confusing bunch who like speed and are not for patience. In addition, while they don’t want government interfering in their lives, they want “safe” streets with lots of signs and the luxuries of large highways that they do not have to pay for upon each use. Taking the signs away would inevitably be spun as a dangerous idea of a radical intelligencia and those patsy Europeans. Perhaps I am too harsh, but I find it difficult to believe that any community would take their signs and stop lights away and trust the instincts of their fellow drivers. If these ideas are to catch on at all it will occur in new towns or new developments where the streets have not yet been paved and there is an opportunity to experiment. Of course there is not a whole lot of new residential construction currently occurring, but it is possible that developers and towns will rethink the traditional notions of engineering traffic. I hope someone gives it a try, because if people see it work in one place, it may catch on in others and lives may be saved. That is what is most important.